Sometimes you get to a destination and it doesn't live up to your expectations. Well, Jokulsarlon glacier lagoon in Iceland smashed every expectation I had. Mr W and I are massive fans of Iceland and have been lucky enough to visit twice in the last year. Iceland really captured my heart due to its amazing and futuristic volcanic landscape, ethereal stunning beauty, breathtaking shimmering waterfalls and natural geothermal spas. The people are super cool - stylish yet traditional, and the food is amazing, with lots of fresh fish, organic produce and independent restaurants rustling up exceptional cuisine. Our trip to Jokulsarlon came about during our Iceland road trip in August, going from Reykjavik, in the south to Akeruryi in the north of the country. 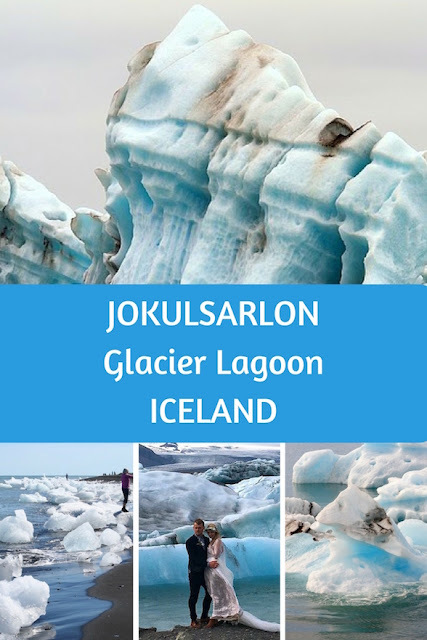 Now Jokulsarlon is one of the wonders of the natural world. I had heard about this place and seen photos but nothing can prepare you for the beauty of this place. It is literally jaw-dropping. Every year thousands of people flock to this beautiful glacier lagoon in the south-east of Iceland. A filming location for the James Bond films, A View To A Kill and Die Another Day as well as Lara Croft, Tomb Raider and Batman Begins, the amazing landscape is also perfect for wedding photos and we were lucky to spot a couple having their photos taken! Jokulsarlon is a naturally formed lagoon, being about a couple of hundred meters deep. 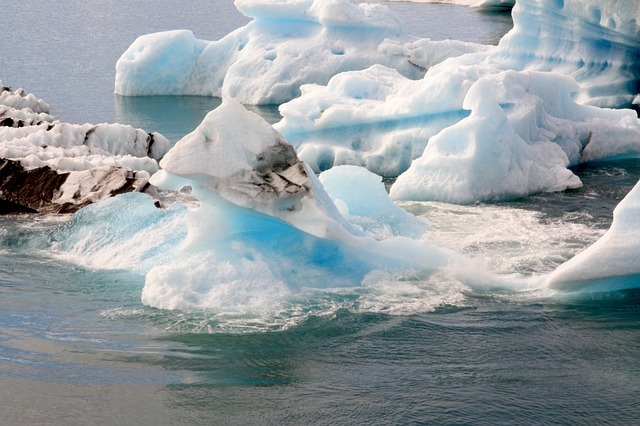 What you see is the tips of the icebergs above the water. Although it seems like the lagoon has been there forever it is only about 80 years old. 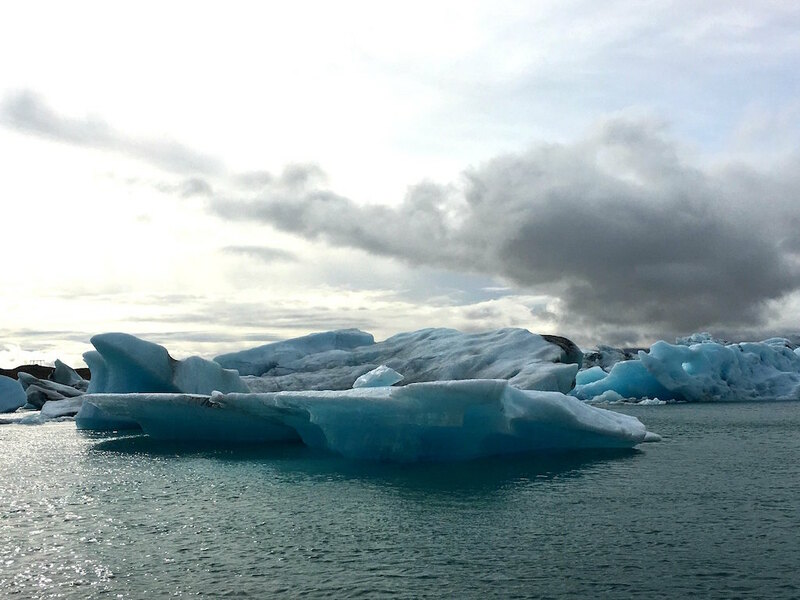 The icebergs come from Breidamerkurjokull, part of the Vatnajokull glacier, developing into a lake after the glacier started receding from the edge of the Atlantic Ocean. 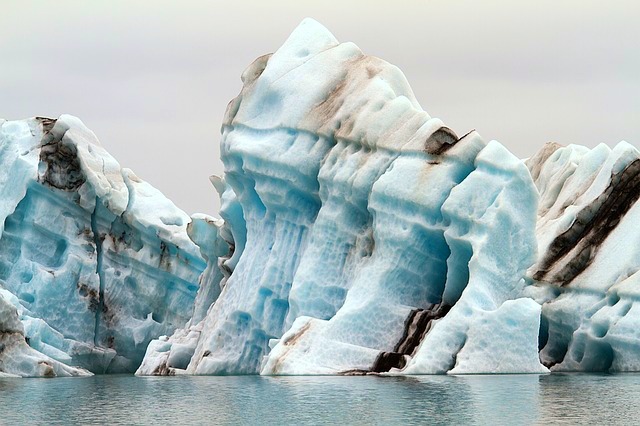 The icebergs vary in colour from bright blue to milky white due to the amount of air in the ice and the interplay of light. Every so often you can hear a whoosh and see the spectacles of icebergs breaking off. This is the reason why you should never climb on an iceberg. I'm sorry to say this but people really do and it is so dangerous, so please be safe. If you like wildlife, be sure to go in the Winter where you will see a number of seals. Boat tours operate between April and October and these need to be booked in advance in case they sell out, as they do. They offer Zodiac and Amphibian boat tours. 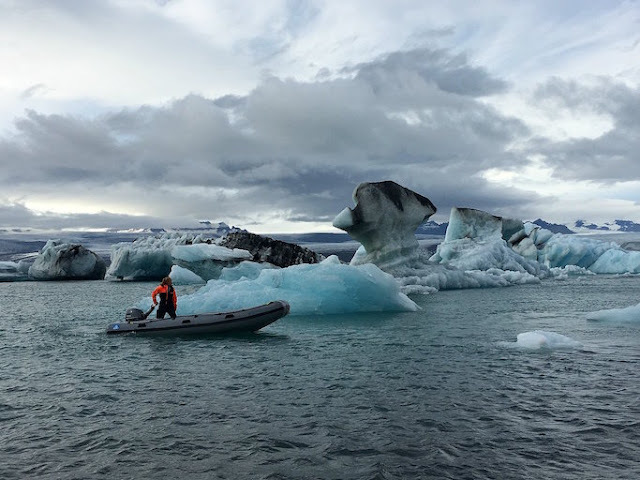 The Amphibian tour is a larger boat whilst the Zodiac tour is smaller and you can get closer to the icebergs. 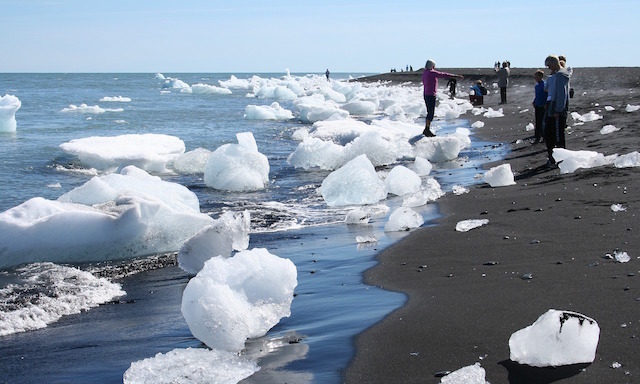 If you drive over the road or walk over the bridge for a few hundred meters there is an area called Diamond Beach where large icebergs get washed up on the black volcanic sand. To see these large white chunks of ice against the contrast of the coarse black sand is really a sight to behold, you can tell why they call it Diamond Beach. There are restroom facilities, a small cafe and food trucks at the car park of Jokulsarlon. Prices are typical Iceland prices, so very expensive. If the price is an issue bring a flask of hot drink and snacks from a supermarket. Boat tours leave from here are well as tours of an ice cave in the Vatnajokull Glacier. Jokulsarlon is a 5-hour drive from Reykjavik with no stops. It is just off the Route one ring road between Hofn and Skaftafell. It is a good idea to split the journey, as there are lots to see along the way including the stunning waterfall of Seljalandsfoss which you can walk behind, Skogafoss waterfall, as seen in the film The Secret Life Of Walter Mitty, the black beaches at Vik and Reynisfjara, the Eyjafjallajokull volcano and much more. In fact, I would recommend splitting up the journey into two days as the south of Iceland is great for exploring nature. We managed to even hike a glacier on our trip! There are a small number of hotels and guest houses nearby including the Hali Country Hotel and the Skyrhusid Guest House. We stayed in Fosshotel Nupar just over an hour away and loved the minimalist design and excellent buffet breakfast. I highly recommend you book the accommodation in advance as especially in the Summer months it gets booked up. Jokulsarlon glacier lagoon is an amazingly beautiful place and one which you must see if you are exploring Iceland's south coast. Don't forget to take your camera, wrap up warm and enjoy what nature has provided. We visited Jokulsarlon during our trip to Iceland a few summers back and loved it, all the more so as we were lucky that there was a rainbow over it from the recent rain, but the sun was shining as we arrived. We took that boat trip around, which was fun. Is the married couple in the first shot you guys? I would have loved to visit when there was a rainbow. I forgot to mention the couple didn't I? It isn't us, we just stumbled upon them having their wedding photos taken which was so sweet. Iceland is really beautiful Rebecca, you must try and visit one day. This is utterly breathtaking - what an incredible vista! The photos are beautiful and it sounds as if it was a wonderful trip. A funny thing I noticed is that the snow by the bride looks like a tail. Regardless, I am sure that 99% of her photos are perfect. Wow what a gorgeous place to visit. This looks like a place I need to add to my visit list. 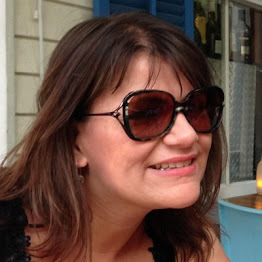 Great post thank you for sharing. Wow what an absolutely stunning place the blue in the ice is just stunning. No wonder people decide to have wedding photos there. I know, it is amazing isn't it? I would just love to listen to you say all the places you visited! Iceland is a beautiful place and it would quite fun to see it in person. Aw thank you, it must be my Welsh accent ha ha. 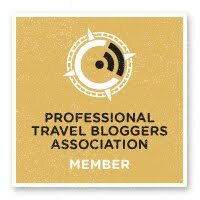 Id love to vist Iceland your photos are stunning and makes me want to be able to visit even more. 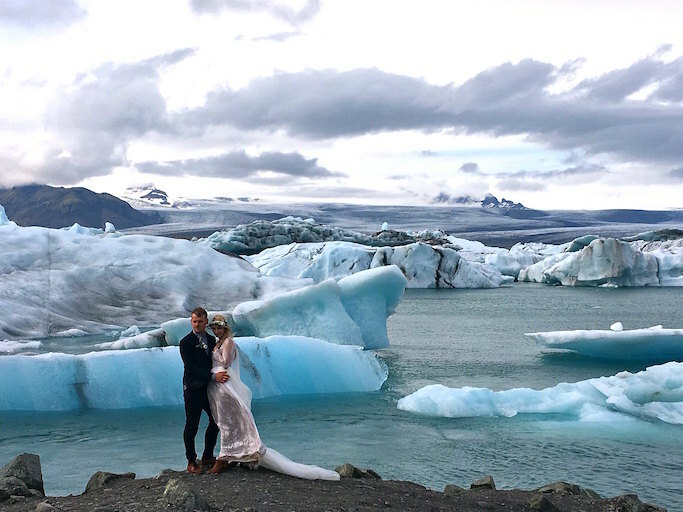 How amazing that you got to see a couple get married by the Jokulsarlon glacier! Aren't the glaciers beautiful in the way that they keep changing colours? The light in Iceland is amazing and it helps when you are taking photos. OMG! I am blown away by the beauty of this place. Adding this place to my bucket list. That place looks absolutely amazing! I'd love to visit this place someday. All of the photos are great and imagine being here during sunset or at night full of stars. ...Or being here and seeing the northern lights! What an amazing trip and great photos. As a photographer Iceland is high up on my list! Hiking on a glacier must have been amazing! We saw a group of photographers at one of the hotels. Iceland is so special. It's actually not too cold believe it or not. I mean it doesn't have extremes of temperature that New York has! It's generally not that warm and can be windy but not as cold as some people think. It's an amazing landscape and what a place to have your wedding photos. It makes Cardiff Bay look decidedly tame!! Iceland looks stunning, for some of the shots it's almost like I can almost hear David Attenborough's voice in the background! Ha ha, me too Emily! Wow! I really want to go to Iceland. My parents are heading there in a few weeks and I'm so envious. It really blew me away. Iceland is high on my list of places I have to visit. It looks absolutely stunning. This is such a cool place to visit. Such a memorable place to get a wedding photo taken. How amazing will their photos look?! 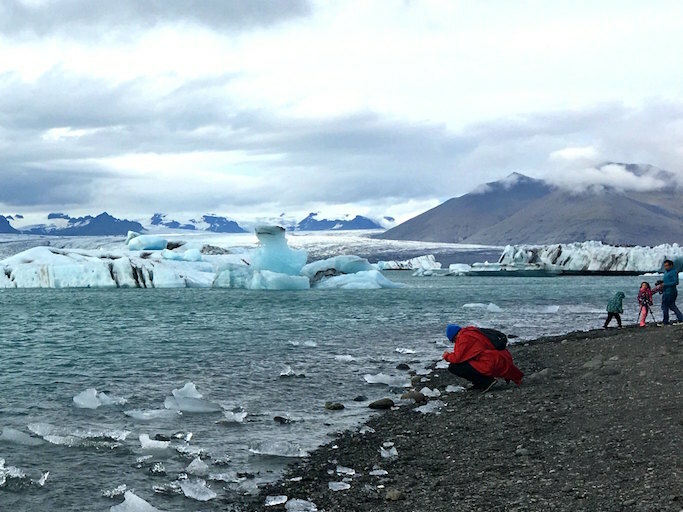 What a spectactular place - I love the look of Jokulsarlon - and those wedding photos are just going to be stunning! You wouldn't catch me climbing an iceberg - but it's amazing how daft some people are! It is amazing how silly some people can be. Safety should be a priority. What an amazing trip! We'd love to visit Jokulsarlon some day. The colours of blue are almost magical! Wow, those photos are beautiful! I'd love to visit Iceland, it looks amazing. It is such beautiful place, I fell in love with it when I went in February and had to go back as soon as possible. What an absolutely stunning landscape, Iceland is somewhere I've always wanted to visit but never quite made it there. What a beautiful country! It is an amazing country and so full of natural beauty, it just took my breath away. Oh man, that looks like an absolutely beautiful landscape to experience! It really was just drop dead gorgeous Lynne. Wow it looks absolutely stunning - almost like a painting. What a great experience. I would love to visit one day! Jokulsarlon seems so charming and astonishing, Mel! I fell in love with the place from your pictures! How many days would you recommend staying there? There isn't much around Jokulsarlon so I would recommend planning to stop there on your way to the east of the country. Iceland is totally beautiful and I agree so spectacular in scenery. I would definitely love to visit it one day. Oh wow! This looks totally amazing! I've never considered going there but we might re-think it. Such a wonderful and beautiful country. The more I see of it, the more I long to go. Love the wedding photo, isn't that just perfection! I know! I would have loved to have gotten married there. Iceland is very much on my destination bucket list. 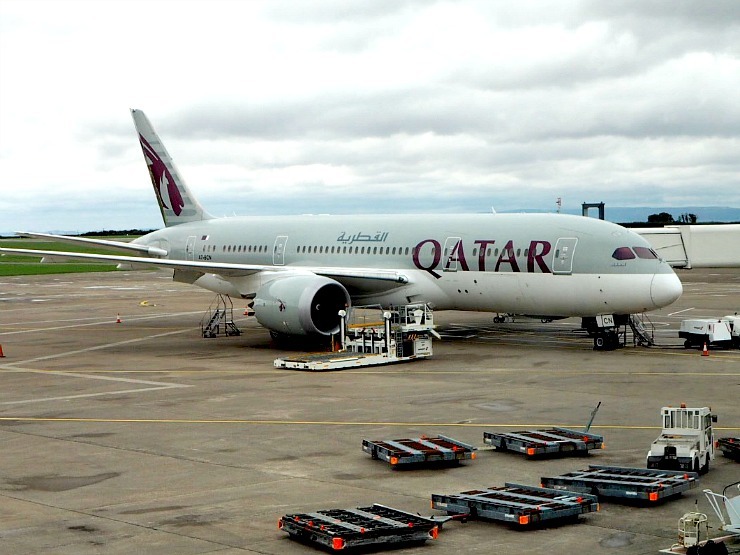 I spent five hours there once in the airport, but that doesn't count, lol! Breathtaking photography and scenery. Now I really have to go!! !